Chief Secretary Kelvin Charles said a probe has been ordered into the death of Mavis John-Peters, 48, who died at the Scarborough General Hospital on December 20 of stomach cancer. “So far, we have only heard one side and in an effort not to be premature on this, a probe would have been ordered. 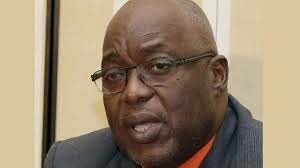 So, all I can say at this time is that I have requested an investigation and report on the matter,” Charles told Newsday Tobago on Saturday. He was responding to calls from Glen Peters, 45, husband of John- Peters for answers on his wife’s death from officials of the Tobago Regional Health Authority (TRHA). Reports are that John-Peters of Delaford began visiting the hospital in September vomiting and complaining of abdominal pains, complaints of feeling unwell and for. She was allegedly given Panadol and high blood pressure tablets and sent home. John-Peter’s plight was highlighted on Facebook by the Minority Assemblyman Farley Augustine, who said he met Peters, a member of his constituency, some Saturday nights ago at the in FCB crapark in Scarborough. “I was busy heading to a concert with my girlfriend, but he pulled me aside. He looked dishevelled. He looked defeated. He told me that his wife was sick. She was sick for a while. He had just come from one of his countless visits to the hospital. “She kept getting ill and the doctors were giving no explanation. She was in constant pain and she kept vomiting. She kept going to the hospital and she kept getting discharged with painkillers but no explanation. He wanted me to call whoever I know to beg them to have a biopsy done. He had a strong feeling she had cancer of some sort. He said he had begged them to do that, but they were not taking him on. So, I promised him I join him in the begging,” Augustine wrote. He said even his efforts went in vain, that he learnt that being an Assemblyman, especially a Minority one, meant nothing when it came to to healthcare on this island. “You can beg all…In fact, I now learn that people only move when you go on TV or Facebook and behave undiplomatic. In other words, if you don’t cuss in this place, you get nothing done.,” he said. Reply to "Woman given Panadol, blood pressure pills"